David Schramm, assistant professor in the MU Department of Human Development and Family Studies (HDFS) and HDFS doctoral students Graham McCaulley and Shaun Calix. The MU researchers developed the in-person and online versions of Focus on Kids, a training course that helps parents going through divorce build stronger, more supportive relationships with their children. COLUMBIA, Mo. – More than half of all marriages end in divorce, and the majority of these involve children, according to the National Center for Health Statistics. Conflict between parents, before and after divorce, is associated with feelings of anger, helplessness, loneliness and guilt in children. Now, an online program created by University of Missouri researchers is teaching separated parents to maintain and nurture relationships with their children. Avoid using the child as a messenger – discuss parenting and financial issues directly. 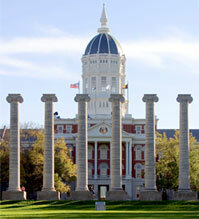 MissouriFamilies provides research-based solutions for contemporary challenges in human lives. MissouriFamilies is provided by University of Missouri Extension, a partnership of the MU campuses; Lincoln University; the people of Missouri through county extension councils; and the Cooperative State Research, Education and Extension Service of the U.S. Department of Agriculture.